Every summer on July 4th weekend in San Francisco, Fillmore Street is home to the largest free jazz festival on the West Coast: The Fillmore Jazz Festival. The festival annually attracts more than 90,000 people from all over the City, the Bay Area, and beyond. Visitors gather to celebrate and enjoy a musical tradition of live jazz, rhythm and blues, and gospel as well as local culture and fine cuisine in the heart of the city by the bay. This year the Festival celebrates its 26th anniversary by once again blending art and soul from sunup to sundown, from Jackson to Eddy, presenting the music of old favorites as well as new ‘up and comers’ on multiple stages. You can also browse 13 blocks of fine arts and crafts, enjoy gourmet food and beverages, and participate in cooking demos by the Fillmore’s finest chefs. Art and crafts include photography, painting, woodwork, metalwork, jewelry, pottery, clothing, hats, and children’s toys – over 200 artists and craftsmen. Delicious “street food” includes oysters, calamari, fish & chips, grilled chicken, bbq pork, jambalaya, tri-tip and even food from the new local restaurant, Out the Door. The event will also be pouring fine wine and beer. You can also participate in hourly cooking demos near the Fillmore Center Plaza, featuring chefs from noted local restaurants. Against the backdrop of World War II, dozens of Fillmore Street Jazz clubs hosted the era’s major musical talents, including Ella Fitzgerald, Duke Ellington, Count Basie, and Billie Holliday. Stars such as Joe Louis, Marilyn Monroe, Clint Eastwood and Sammy Davis, Jr. sparkled in the audience. At the legendary Jimbo’s, Louis Armstrong went to check out Charlie Parker (the only known time they were under the same roof). Chet Baker snuck out of the Fort Mason barracks to jam all night, and John Handy played Bop City with John Coltrane. In the 60s, Jazz historian David Rosenbaum ran the Melrose Record shop on Fillmore Street, employing high school student Maya Angelou. Zen Buddhism was first introduced to the West in the Fillmore, which became a creative home to artists including Isaac Stern, The Grateful Dead, Janis Joplin, Mel Blanc and Alan Ginsberg. Although much changed following the area’s redevelopment in the 1970’s, the jazz spirit proved tenacious. In the 1980’s, a renaissance gave rise to the next generation of the Fillmore District. Merchant associations helped launch the first Fillmore Jazz Festival in 1985, giving new expression to the storied neighborhood. 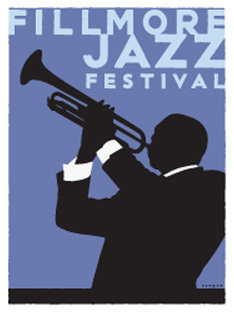 In 1999, the festival came home to the newly revitalized Jazz Preservation District. Performers who have graced Fillmore Street stages include Dr. Lonnie Smith, Denise Perrier, Lady Memphis, Kim Nalley, Pete Escovedo, Jules Broussard, Big Belly Blues Band, Brenda Boykin and Paula West. Today, Fillmore Street once again hops with an acknowledging nod to the spirit that once filled the street. Boasting an eclectic mix of over 200 businesses: music clubs, shops and restaurants, it continues to echo the music of its birth, transcending boundaries, embracing diversity, and celebrating personal style.